03:05 – Since you’ve been in Serbia, how many times did you try to cross the border? 03:14 – I tried to cross the border around fifteen times. 03:18 – How many times did you try to cross the border into Croatia and how many times into Hungary? 03:20 – I haven’t tried to get into Croatia. It’s always been into Hungary. 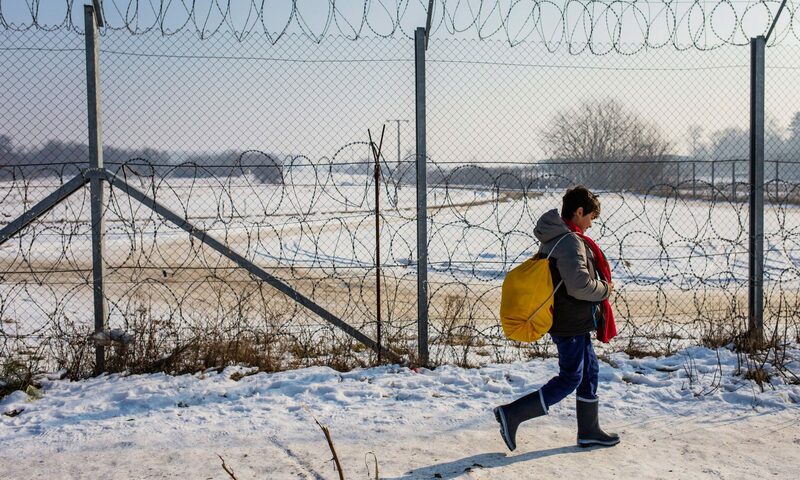 03:23 – How did you go from Belgrade to the border the last time? 03:25 – From here we went to Subotica, and there we spent one night. From Subotica we went towards Hungary. We waited near the fence. The patrol cars were watching and we were waiting for them to leave and get a chance to cross. When the patrol cars left, it was around 8pm and we got a chance to cut the fence. When we cut the fence we crossed into Hungary. We runned for 10 minutes and after that we came across two policemen. 03:53 – What did these two policemen do to you? 04:28 – When they arrested you in the forest, did they make a line of seventy people? 04:33 – No, they were separating us, there was a line for Afghans and a line for Pakistanis, then they beat us a lot and told us to sit [in the open space]. 04:43 – They made separated lines for Afghans and Pakistanis? 04:47 – What kind of rude words were the police saying to you? 04:52 – They were using very rude words, they came close to us and made fart sounds like they were shitting on us. We were lying on the ground, they arrested us at 8pm and released us at 3am. 05:02 – Were they sitting on you? 05:04 – They were walking on us and were laughing, they were also throwing water and alcohol on us. 05:11 – Walking like this on you? 05:12 – Yes, they were walking on us while we were lying down. There were a lot of policemen walking on us. 05:17 – There were a lot of them, countless, also young and old women. 05:22 – Where in your body were the policemen stepping on you? 05:29 – Did they also beat you when you were lying on the ground? 05:32 – Yes, they beat us a lot, strongly, using everything, and they also released the dogs on us. 05:34 – Were the dogs biting you? 05:36 – Yes, the dogs were trying to bite, but they had a muzzle on. They were scratching people, when it was my turn the German police arrived. 05:43 – When did they spray you? 05:45 – When we were coming back to the border in the line, at that time they were spraying and beating us. 05:54 – Did the spray make you cry or cause any trouble to your breathing? 05:57 – Yes, we were crying a lot, we couldn’t breath. When we were crying, they beat us again a lot. 06:03 – How did the police push you back into Serbia? Did they open a door and push you through it? 06:11 – First, they took pictures of us and broke all our mobiles, then they pushed us back one by one. 06:24 – Did they give you back your mobile? 06:25 – They didn’t, they broke them right there. 06:26 – Then the helicopter came. 06:31 – When it came, were you in Serbian soil? 06:32 – Yes, when we came into Serbian soil. 06:34 – To make sure we don’t go back to Hungary. 06:37 – Was the helicopter above Serbia, or above Hungary? 06:39 – The helicopter was above Serbia, and also the policemen were coming behind us, with the dogs, into Serbia. 06:49 – Did Hungarian police cross into Serbian soil and chase you? 06:52 – Yes, they were coming behind us, when we entered the forest in Serbia the police started to run behind us. 06:58 – Did the Hungarian policemen beat you again in Serbian soil? 07:00 – When we entered in the forest, the Hungarian police released the dogs, and the dogs were running behind us. When the dogs were getting near to the forest, the police called them and the dogs stopped. 07:08 – When you were in Serbian soil with the Hungarian policemen, was there any Serbian police that saw you both? 07:15 – No, there was no Serbian police. 07:19 – What happened to your finger? 07:20 – They bend my finger like this, and when I screamed they started playing football with my body. 07:26 – In what parts of your body did they beat you? 07:30 – On my back and on my thighs. 07:34 – How did they beat you? 07:35 – They were kicking me.